Can Max Verstappen's luck change in home races? More than anywhere else, F1 drivers will want to impress on home soil. But that hasn't been possible for Max Verstappen in recent years. While there isn't a Dutch Grand Prix, despite rumours of a Zandvoort return, Verstappen's army of orange-clad fans travel in numbers to races in Austria, Germany and Belgium to support the Red Bull star. They have left disappointed more often than not though. In Austria last year, Verstappen's race was over by the first corner after he was an innocent victim when Fernando Alonso collected him after himself being punted off by Toro Rosso's Daniil Kvyat. Later at the Belgian Grand Prix, engine problems forced him into retirement after just eight laps, pulling over on the Kemmel Straight in front of his fanclub. 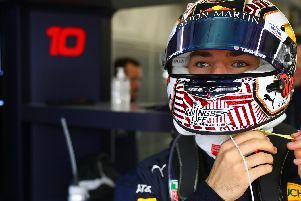 This weekend, Verstappen heads back to the Red Bull Ring in Austria, not only the circuit owned by his team, but his first 'home' race of the campaign too. And he heads there in great form too, with three podiums in four races after his second place in France last Sunday. “The Austrian GP is always a special one," he said. "It is of course the home of Red Bull so we have a good following of Austrian fans and also a lot of Dutch. "Two years ago I was on the podium so it would be really nice to get back up there this year in front of all our supporters. Last year ended way too soon due to contact at turn one so I’ll be out to make up for that this year. "This year there will also be a stand full of Dutch fans there, so that will make it even more special. There is in fact a Dutch campsite just outside the circuit which I heard around 5.000 fans are attending, that sounds like it will be fun, certainly noisy!" Verstappen heads to Salzburg sitting sixth in the championship standings, 28 points adrift of team-mate Daniel Ricciardo. The Australian, who is out of contract at Tilbrook at the end of the season, has won twice this season and is third overall and claimed the final podium spot in Austria last season. He said: “Austria is a short lap, but a very busy one. It’s pretty hectic, the middle and last sectors are really fast, in fact the final two corners are my favourite, especially in the current cars. "The race is intense and feels high paced from start to finish so you have to concentrate hard. As the lap is so short there is no room for error, one little mistake will cost you, as all the times are very close."